Eliot, who was an extraordinary poet, has successfully grabbed the very spirit of modernism so early and more or less complete simply because he became a modernist poet even before modernism had been invented. As a matter of fact, Eliot was able to put himself into a picturesque category along with other modernist figures, like Picasso, especially when he enraged journalists who approached him about the meaning of one or another of his poems or plays by replying:"it means what you want it to mean". Thus, he proved that all poems that are truly poetry and not simply versified statements must be in some degree open to the differing interpretations according to our various needs, personalities and circumstances imposed upon them. It is worth noting that Eliot's poetry approximates symbolist rather Imagist movement for the sensuous emphasis in his poetry fell more upon the ear than the eye, a music which cast the feeling inward declaring an instantaneous verbal rather semi-musical event. In other words, Eliot's poems delivered a succession of deeply interwoven sounds that has the ultimate ability to provoke the reader's imagination, and therefore allowing at the same time an overflowing of passionate feelings. In fact, his poetry parallels closely the developments of non-representational techniques in painting and of a tonality in music. Moreover, what characterizes such poetry is that the diction moves more closely to that of prose; it uses no special poetic terms, no decorative inversions, and it sheds some of the abstract burden which prose carries. Furthermore, such poetry, for the first time, seems to declare emphatically that it exists in its own right and for its own sake; besides, its simple diction and its apparently orthodox syntax mime meaningful speech so perfectly, offering, in their sedative music, such a sense of case and comfort. Eliot, unlike Yeats dismissed any kind of predetermined forms, for he rejected the enslavement to the hindering restraints that prevented any poetic experience to be projected in its full aesthetic features. Thus, Eliot has the further freedom of "vers libre" and the "open form"; therefore, he adopted a wide range of musical and metrical possibilities that could always appeal to his instinct. In fact, Eliot always began with the music-that arouses a feeling, a rhythm, a cluster of images, something just coming into focus and works toward crystallizing it. As a result, his poem finds its form as it goes where the sense of the lines may be patterned by the music, rather than the music by the sense. In addition, his poetry forces us to recognize that a poem is essentially a verbal machine far more complex in its operations than any meaning, it may accidentally said to have, or express, or contain. It's worth noting that despite Eliot's great artistic gifts, he was open to attacks of the surrounding circumstances. Accordingly, as he became more deliberate, more responsible, more answerable to the world, he denies himself a liberty, a freedom of imagination, which in turn robs his poetic language of some of its life, and this is done in the name of something external and at the same time abstract to the poem, such as a political faith, or a religious doctrine. In fact, Eliot, in his submission to religious as well as political influences, favored his ordinary self over the poetic one depriving it from its quality of completeness; nevertheless, he was already aware of the pressure the world exerted upon the preserve of the poetic imagination, and the temptation to give into it. Consequently, Eliot's continuing allegiance to 'Action Francaise' and his unequalled support to the 'Fascist Movement' made him blindly driven to examining the elements in the situation, mainly the situation of the poetic experience which frustrated his labor as an artist. 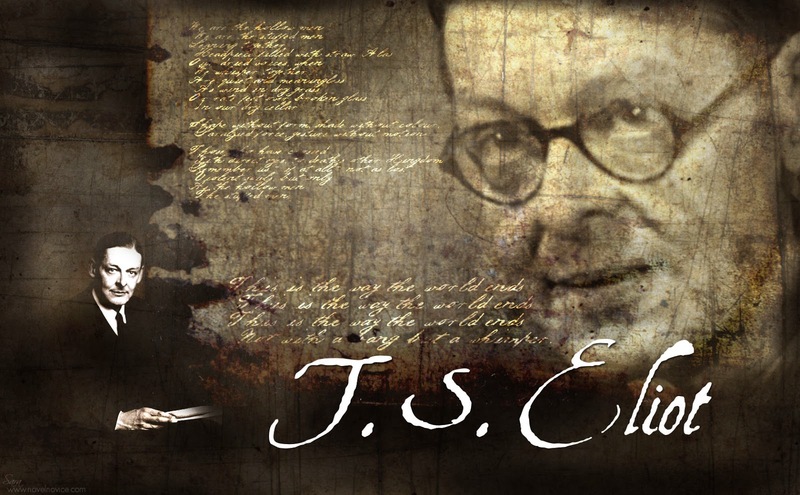 As a matter of fact, Eliot, despite any deficiencies that always threatened his reputation as a modern poet, presented magnificent poems which are very near to the techniques of modern painter. He were developing at the same time, in which colors and forms were worked into relationship, not in order to "represent" in any direct and obvious sense, but to create an artistic unity, where 'artistic' means neither objective realism nor pure subjective design but an enactment of their meaning. Copyright © 2018 BloomyBooks. Awesome Inc. theme. Theme images by kim258. Powered by Blogger.